The original front of the services. When the motorways were being engineered, they appear to have under-estimated how many people would drive to the West Country during the summer. Even when Michaelwood was being designed in the 1960s, the formulas said very few people would be using the services, so two temporary buildings were built to hold the fort until the traffic levels had risen enough to warrant building full services. The temporary buildings were deliberately placed next to the motorway, so that the best position (offering "woodland views") would become parking areas that could easily have new buildings built on them. However when it came to it, that plan was cancelled and the temporary facilities were expanded. New recruits at the Ministry of Transport described it as "incomprehensible". This inadvertently created the unusual layout where the two sides are completely identical, as they both have the amenity building tucked away at the back. Applications for the original temporary site were made by Mobil, Esso, Texaco and a joint entry from Shell and BP. The amenity building consisted of toilets and a workshop on one side of a walkway, and a shop and a snack bar on the other. This walkway was then extended to offer more facilities. Originally the restaurant had large windows, a brown tiled floor, green bench seats and oak-coloured tables. The contract was renegotiated without being opened to rival bids. Mobil had previously tried to hand their contract back so they could bid for a better one. Thornbury Rural District Council wanted to see a caravan park built here, but the MSA Board said it would be difficult to run and would be abused. It also seems to have some of the highest-standard slip roads of all motorway services. In 2001, Welcome Break considered completely rebuilding the entire site, moving the amenity building closer to the front. Instead, in 2011 the car park layout was changed around. This created a long car park with a snack bar at the back, trying to manage the high flow of traffic during the holiday period. In doing so, the petrol stations were moved away from the back of the building, losing the original 'something temporary' plan which had created this unusual service area. In Spring 2017, Transport Focus calculated a 89% satisfaction score for the northbound services and 93% for the southbound services. By 2018 this had increased to 96% and 92%. In 2015, the services were rated as 4 star by VisitEngland. In May 2012 and August 2011, VisitEngland rated the services as 3 stars. In 2008 the services won a five star loo award. In 2007, the services won a five star loo award. In 2006 they got four stars. Also in 2006, Holiday Which? rated the services at 3/5. In 2000, The AA rated the services as "poor", because of its "unattractive buildings". In 1991, a Which? survey "recommended" the services. 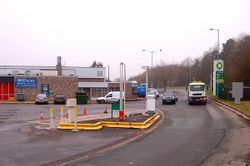 A 1978 government review said that the services were just a large and badly-managed petrol station, which was "giving service stations a bad name". In 1977 Egon Ronay rated the services as "appalling", calling it "drab", "scruffy" and "tired", with a poor choice of food, incompetent cooking and dirty toilets with no hand driers.